Everybody likes beautiful, yet natural-looking teeth. Hence, this is the most common concern with patients who want to enhance their smiles with porcelain veneers: "Will they look natural?" There are many ways to make dental porcelain restorations look like real teeth. The first step is to understand what a natural tooth really looks like. Young teeth have different features than old and worn teeth. They vary in hue, chroma, value, height-to-width ratio, line angles, opacity, translucency, and many other features, all of which are being discussed on this website. Not every smile design has to involve a large amount of teeth. In many cases, the correction of just a few teeth with porcelain veneers may make a big difference for the self-esteem and confidence of a patient. The art of cosmetic dentistry is not characterized by just making teeth white and shiny, but by creating smiles that have youthful-looking and natural teeth. 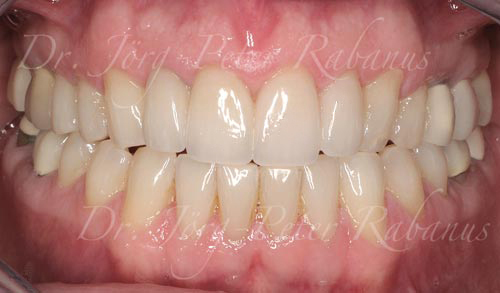 The following case demonstrates a minimal approach for improving a smile with porcelain veneers. 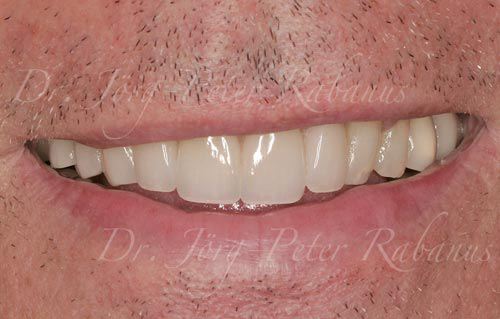 Our patient was concerned about several aspects of his smile. 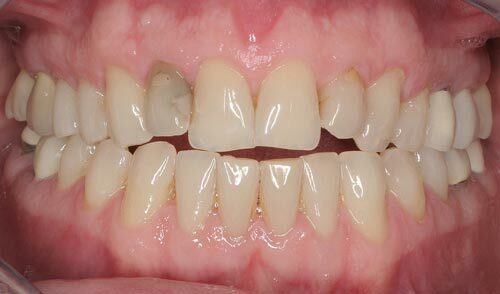 He was concerned about the discolored right lateral incisor that was root-canal treated many years prior to his visit with us. He also wanted to address the size differences and misalignments among his front teeth. Even though his smiling upper lip remains naturally tilted, the incised edges of his upper anterior teeth are level with the horizon and his interpupillary line, hence representing its natural relationship to the maxilla. This image displays the patient's individual concerns without the element of his upper lip position. 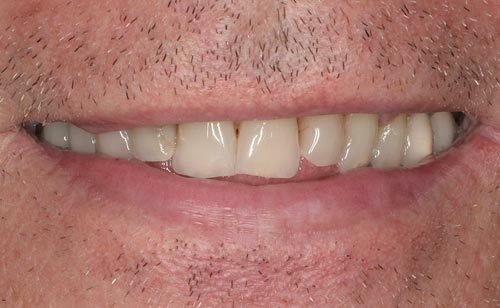 This post-operative image shows a very natural outcome where the porcelain mimics the internal structure and texture of the neighboring teeth while giving a "refreshed" appearance of his new teeth.